Located close to Paris and the Loire Valley, Chartres enjoys international renown, thanks to its cathedral- a UNESCO World Heritage Site. The sparkle of its unique ensemble of stained-glass windows, the exceptional diversity of its historical interest, the Festivals of Light and Perfume and its multitude of beauty specialists, all located in the very heart of the Cosmetic Valley, have made Chartres the Capital of Light and Perfume. Its historical, picturesque and preserved districts, its mounds tumbling towards the banks of the Eure, its ancient churches, and the rich collections of its museums urge us to wander and relax. Finally, the presence of many shops and artisans of art, combined with the richness of the festivities that bloom all the year, make Chartres a city full of liveliness and joy. 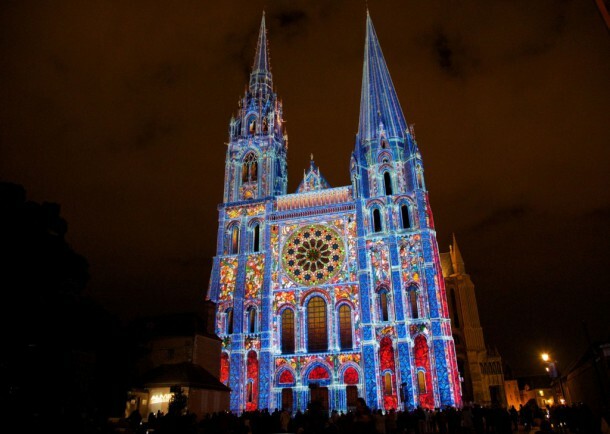 To find out more, visit the Tourist Office and Chartres en Lumières websites. Ever rode a hot-air balloon? Then it’s time to ride one! Air baptisms are available just 18 and 21 km from Chartres. 2 extra golf courses are located 22 and 29 km respectively from the city center. If you want to discover the gastronomy and some products of the region, eat at L’Écume Restaurant (on property).